MAPUTO – PROJECTIONS that the death toll in the Tropical Cyclone Idai sweeping through Southern Africa has reached 1 000 makes this possibly the deadliest cyclone ever recorded in the region. Malawi, Mozambique and Zimbabwe are bearing the brunt of the crisis, which has left a trail of destruction in its wake. The cyclone hit Mozambique first on Thursday night, with the city of Beira and its surrounding villages receiving the heaviest blow. It continued from there to Zimbabwe and Malawi. Humanitarian organisations said there was an ongoing risk that others will lose their lives to flooding in the cyclone-affected region, with rainfall expected to continue. On Monday, Mozambique President, Felipe Nyusi, on a visit to Beira said the effects of the cyclone were devastating. Aid agencies corroborated the president. Marc Nosbach, CARE’s country director in Mozambique, said roads to the areas hit by the cyclone had been completely blocked by fallen trees and rubble. “The infrastructure has been completely destroyed,” he said. Initial reports indicate significant damage to houses and buildings, including to health facilities and schools. “There is a complete power outage since Thursday’s rainfall. Telephone and internet communications are down,” Nosbach said. Officially, over 2OO people have been killed but NGO said this was way below the true reflection of the catastrophe. “The cyclone has destroyed our homes. Everything has been lost. I am grateful I managed to escape with my children,” said Leila Naimo, a 39-year-old mother of two. Antonio Mutola, also of Beira, is a survivor of many cyclones that have battered the disaster-prone Southern African country over the years. “The Cyclone Eline of 2000 is still fresh in my mind as I lost my home and all I had but I have never in my life experienced something like this (Cyclone Idai). The weather was evil. People died from falling street poles and were hit by rocks,” he said at a makeshift settlement in the city. A humanitarian worker at the settlement, who spoke to CAJ News Africa, said they were struggling to meet demand for food, clothes and blankets for victims. “It is a catastrophe. We have been stretched to the limit in terms of provision of resources,” she said. The camp was established last week amid indications the cyclone will make a landfall with devastating impact. Then, some ten people had died. A community leader, Lewis Simao, said the devastation had taken a mental toll on survivors who in recent years had to contend with drought. “The victims are traumatised beyond description. The damage by Idai on already stressed communities will open emotional wounds that will take time to heal,” Simao said. Beira, with a population of over 530 000 people is the fourth largest city in Mozambique. The Beira Central Hospital emergency wing remains non-operational because of the damage by storms. Parts of Beira Port – including the grain terminal, warehouses and coal terminal – sustained damage. Outside the city, a dam collapsed, causing extensive damage. People sought refuge on the tops of their roofs and trees as rising floodwaters swept through the area. Initial aerial surveys indicated significant loss of life, although exact numbers of people impacted are not yet known. In neighbouring Zimbabwe, an almost similar number has died and over 100 missing. President Emmerson Mnangagwa, who has cut short his trip to the Middle East, has declared a state of emergency. Jamie LeSueur, who is leading the IFRC assessment team into Beira, said this followig after taking part in a Red Cross aerial assessment. IFRC has already released about 340 000 Swiss francs (US$339660) from its Disaster Relief Emergency Fund, which will go towards an initial response effort for about 7 500 people. However, officials said given the scale of the disaster, more resources may be needed to support Mozambique Red Cross efforts on the ground. The team in Beira has identified shelter, health, and water, sanitation and hygiene as priorities. The United Nations Children’s Fund (UNICEF) disclosed children constituted half of the victims of the Cyclone Idai. “Hundreds of thousands of children have already seen their lives turned upside down by the devastating floods, and now Cyclone Idai has brought further suffering to families in its path,” said United Nations Children’s Fund (UNICEF) regional director, Leila Pakkala. UNICEF is appealing for $20,3 million to support the response in the affected countries. In South Africa, International Relations and Cooperation Minister, Lindiwe Sisulu, appealed to NGOs, companies and individuals to make donations towards humanitarian aid for the affected countries. “We have directed all our Embassies and Diplomats to continue to work with the three countries to assess the damage” Sisulu said. Mami Mizutori, the UN Special Representative for Disaster Risk Reduction, said the Cyclone Idai highlighted urgent need to ensure resilience of infrastructure to extreme weather. many parts of the world if we are to break the cycle of disaster-response-recovery,” the UN envoy said. Mizutori said it was particularly distressing that severe damage had been done to schools, hospitals, health facilities and other key infrastructure. This would have consequences not just for the emergency response phase but for the long-term efforts of these countries to eradicate poverty and hunger. “Cyclone Idai is a clear demonstration of the exposure and vulnerability of many low-lying cities and towns to sea-level rise as the impact of climate change continues to influence and disrupt normal weather patterns,” Mizutori said. This past weekend, the United Kingdom sent humanitarian experts to assess the impact of an expected cyclone in Mozambique. The fatal cyclone is the strongest such tragedy to strike after Cyclone Jokwe hit Mozambique in 2008. Jokwe left 123 people dead. 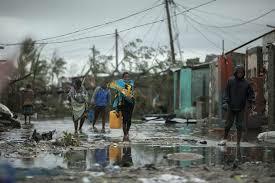 Idai comes as the Southern African countries were reeling from other natural disasters. “Tropical Cyclone Idai makes an already dangerous situation even more serious. Thousands of people have already been affected by drought, severe rains and flooding in the last few weeks,” said Erica Dahl-Bredine, Catholic Relief Services regional representative.